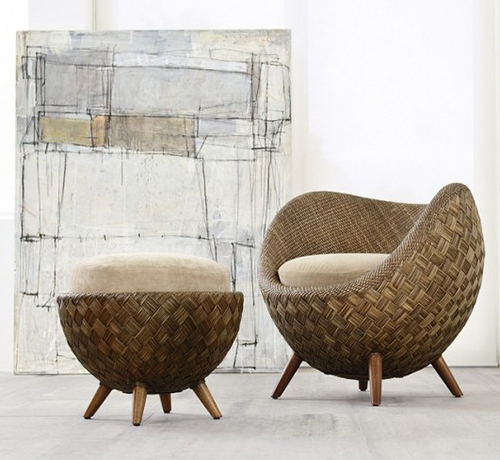 Chair La Luna by Kenneth Cobonpue is a real woven masterpiece, made of jute and rattan. Coponpue’s design ideas are strongly influenced by nature, and this chair’s wonderful round shape reminds us of the moon (la luna) perched in the sky. La Luna looks equally amazing indoors or out – you really can take her anywhere in your beautiful homes! Simple and soft looking, yet full of spirit and texture, this chair is sure to attract some admiring glances wherever it sits. To satisfy your intrigue, stop by the Kenneth Cobonpue website and read more on interior decoration and other home decor products. 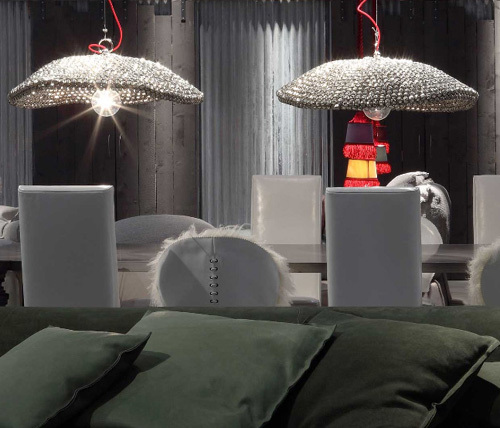 It’s glitzy, it’s glamorous – the Bell lamp by Italian furniture design firm Baxter is the perfect focal point above a dining table or hovering overhead in the living space of your designer homes. 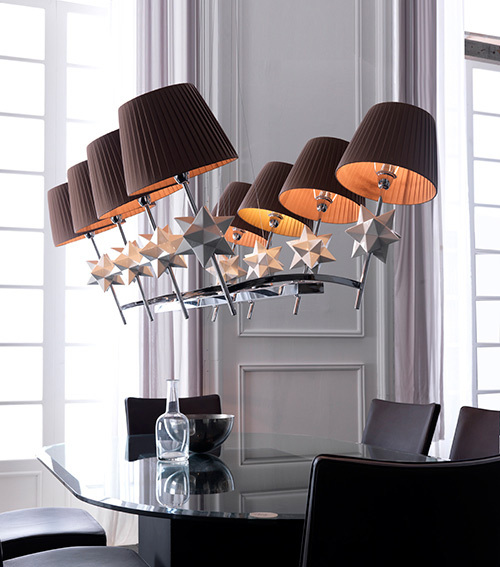 This suspension lamp has just the right amount of sparkle to dress up any room, boasting a broad, shallow shade made of adjoined bells that each reflect the light and twinkle with every movement, from every angle, inside and out. Hang these pendants in pairs or threes to create a striking feature mid-air, or suspended solo for some instant “pop” to your home. More details are available by visiting Baxter. Lighting company Vibia is shining a light on a new, industrial style element for your designer homes – the 45° lighting collection. Sophisticated with a touch of warehouse-chic, these cylindrical ceiling lights have a wonderful built-in feel that draws the eye down and helps highlight your counters, tabletops or bar area. 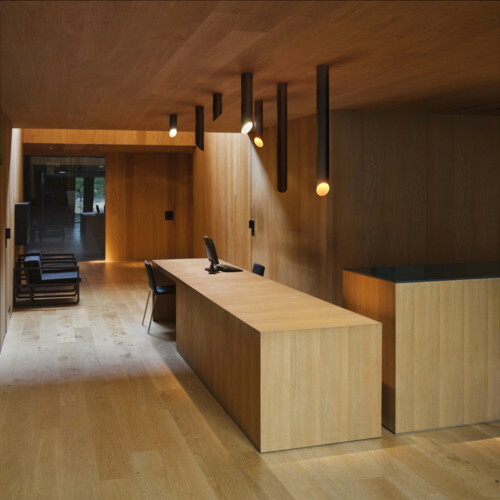 The design ideas by interior designer Victor Carrasco features a 45-degree angle bottom which can be rotated on its axis, adding interest to the otherwise minimalist fixture while focusing beams of light on the task at hand. 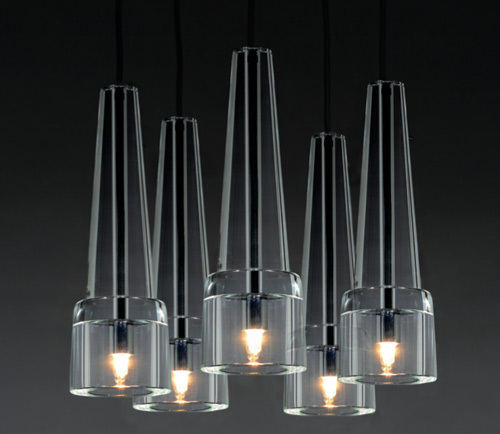 The 45° lighting line is available in matte-white lacquer, black lacquer and peacock blue, and each comes with two interchangeable polycarbonate diffu¬sers in white or orange to create custom lighting effects. Choose a uniform size and stagger lengths for added attraction. Visit Vibia for more info. 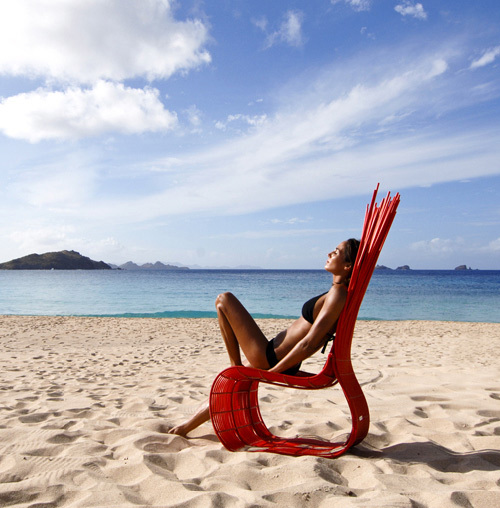 This modern flair chair by Netherlands company Montis is large, yet light – not an easy combination to come by! The Scene XXL chair is a bold designed by interior designer Gijs Papavoine boasting a high back and sides, which are faintly flared like a collar, adding subtle softness to the finished product. Contrasting the soft grey back, the thick seat comes in a range of vibrant colors, set on slim legs in matte steel. This compact but tall piece is a great addition to modern condos and lofts, occupying little space yet making a strong style statement in your designer homes. Additional information on these design ideas and other interior decoration products is available by visiting Montis. This modern flair chair by Netherlands company Montis is large, yet light – not an easy combination to come by! The Scene XXL chair is a bold designed by Gijs Papavoine boasting a high back and sides, which are faintly flared like a collar, adding subtle softness to the finished product. Contrasting the soft grey back, the thick seat comes in a range of vibrant colors, set on slim legs in matte steel. This compact but tall piece is a great addition to modern condos and lofts, occupying little space yet making a strong style statement nonetheless. Additional information is available by visiting Montis. Kalmar Austia has a reputation that reaches far back when it comes to making amazing bespoke lighting – the Keule 5 pendants definitely don’t break the rule. The German word Keule is the equivalent of a bat or club – basically a long handheld item, so you can see where these pendants got their name. It’s actually the Kalmar design ideas from the 50′s and has been reintroduced for our present time. The glass is made of crystal and comes in a clear smooth variation or a hammered texture finish. They’re super modern yet, the mid century vibe lives strong to fit in today’s interior design. They look really great in a cluster, but probably equally fantastic in a row (with the Keule 1 that is). Find out more at Kalmar about this beautiful and other home decor decor products. This award-winning parasol lamp designed by interior designer Jordi Vilardell for Vibia has an informal elegance about it that illuminates the outdoors as much with its light as with its colorful wicker-style weave. 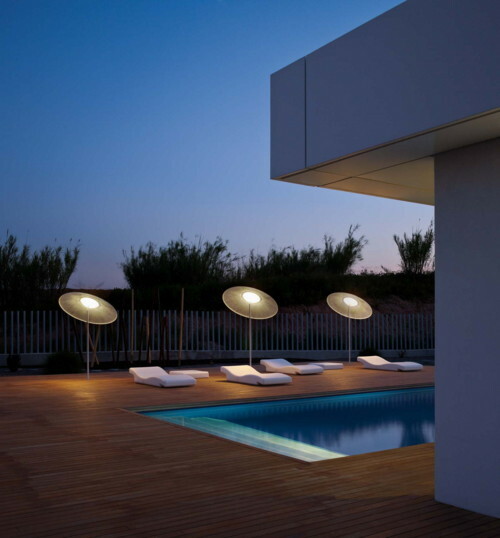 Inspired by this essential patio and pool-side accessory, the Wind floor lamp features an umbrella-shaped shade that swivels so you can adjust its angle as desired. The diffuser lets light permeate with a gentle glow, adding instant romance to any outdoor setting of your designer homes. Make it an alfresco affair and entertain into the wee hours – these casual-chic floor lamps set the tone for a stylish soiree. The Wind lamp is also available in a suspension model. Check it out by visiting Vibia. 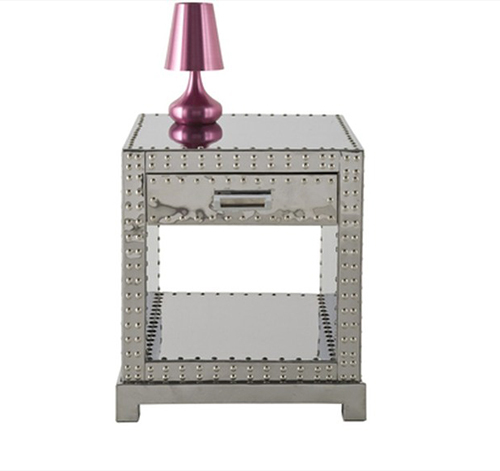 We are not surprised to discover the pleasantly shocking Vegas Collection of aluminum furniture by Kare Design. They’re a brand that tailors to cosmopolitan, trend oriented, design crazy folks with a good sense of humor. Their products always evoke some kind of emotion and the Vegas Collection is no exception. It includes a number of pieces but we chose to display the bedside table, the bench and the chest of drawers all made mainly of shiny aluminum. The bench cover and handles are made of cowhide. 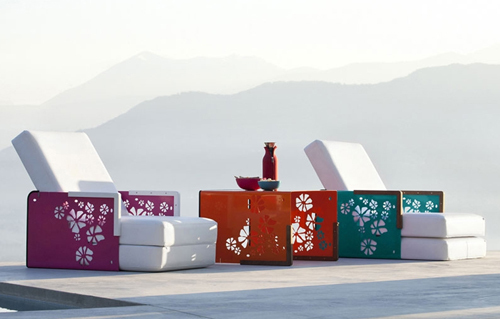 This collection makes quite a bold statement for your designer homes, don’t you think? We think it’s quite fun, yet strong, and highly unique design ideas. Visit Kare Design to learn more. Inspired by Voronoi diagrams, EeStairs designed a creative balustrade system called Cells. The organic shapes, or ‘cell’-like design ideas, is the defining feature of the steel balustrade. The visual effect is stunning – very modern and unique. 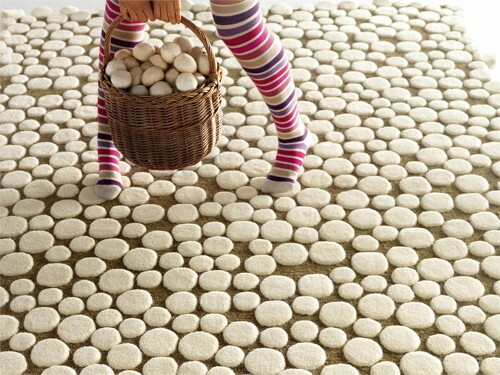 It can easily change the whole vibe of a space in the interior design of your designer homes. 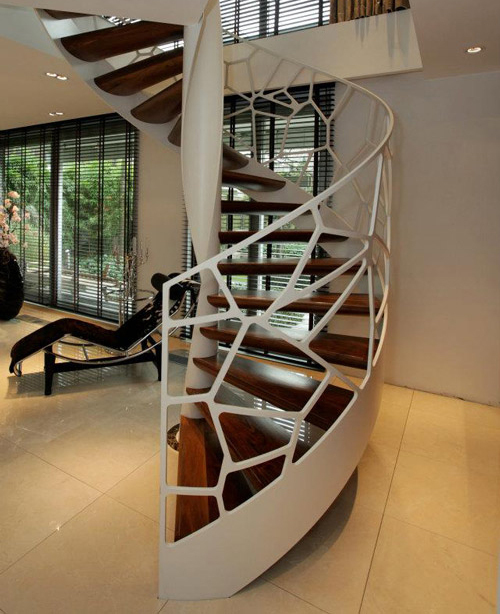 Cells can be installed straight or curved, freestanding or part of a staircase, and available with different size ‘cells’ to suit your tastes or design requirements. I really love the ones with bigger ‘cell’ openings. You? Get more information on interior decoration and other home decor products at EeStairs. 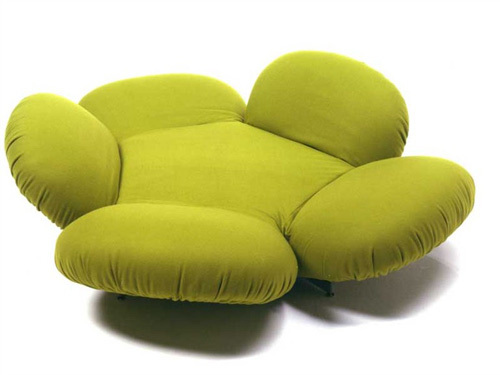 Design ideas inspired by the shape of a flower, this modern recliner sofa called Free by Futura has caught our attention. Its design makes it ideal for lounging sessions or catching some Zs. 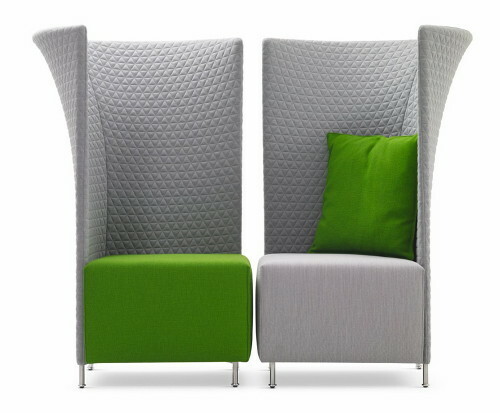 Each ‘petal’ reclines independently so that you can create your perfect balanced environment. The swivel base comes in a black or chrome finish and the cover is removable for easy cleaning and to suit the interior design of your designer homes. It’s definitely a very eye-catching piece of furniture for a modern sitting lounge. Get more details at interior decoration and other home decor products at Futura.